New guidelines laid down by Nebraska and Chinese researchers could steer the design of less costly, more efficient catalysts geared toward revving up the production of hydrogen as a renewable fuel. Nebraska's Xiao Cheng Zeng and colleagues have identified several overlooked factors critical to the performance of single-atom catalysts: individual atoms, usually metallic and anchored by surrounding molecular frameworks, that kick-start and accelerate chemical reactions. The team folded those variables into a simple equation requiring what Zeng described as "back-of-the-envelope calculations." That equation should allow researchers to easily predict how the choice of atom and its surrounding material will affect catalytic performance. To date, researchers have often relied on time-consuming trial and error to find promising single-atom catalysts. "All this (relevant) information can be easily gathered from a textbook," said Zeng, Chancellor's University Professor of chemistry. "Even before an experiment, you can quickly see whether it's a good way to make the catalyst. We're simplifying the process." Using its equation, the team discovered several atom-framework combinations that approximate the performance of precious-metal catalysts—platinum, gold, iridium—at mere thousandths of the cost. One swapped out a platinum atom for manganese; another replaced iridium with cobalt. "There are two (primary) ways to reduce the price of these catalysts," Zeng said. 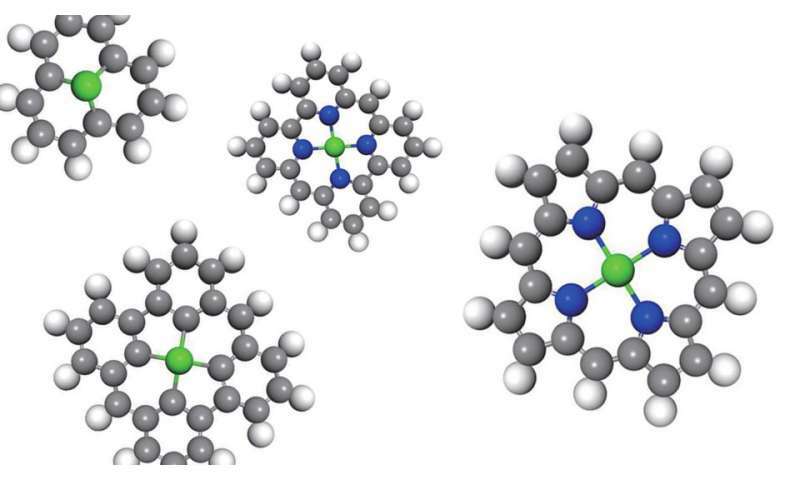 "One is to use as little of the metals as possible—so single-atom catalysts are the cheapest. The other direction is finding alternative metals like iron or aluminum or zinc that are very cheap." Two of the team's atom-framework combinations can split water into its constituent parts: an oxygen atom and two hydrogen atoms, the latter of which can serve as a green fuel for vehicles and other applications. Two other catalyst candidates help oxygen atoms take on more electrons, priming them to bond with positively charged hydrogen atoms and form water—the desired byproduct of hydrogen fuel cells. "Right now, this is not the prevailing way to produce hydrogen," Zeng said. "The industry still uses fossil fuels to produce hydrogen. It's just cheaper. So that's our motivation: lower the cost so that all these cleaner, fuel-producing reactions become (viable)." The researchers found that the number and nature of atoms directly bonded to a single-atom catalyst can profoundly affect how it catalyzes chemical reactions. In some instances, the catalyzing atom might be attached to either three or four other atoms, each of which is itself part of a five- or six-atom ring. Every atom in that immediate network also has a known attraction to electrons, with the strength of that attraction further influencing catalytic performance. The arrangement and qualities of those neighboring atoms matter, Zeng said, in the same way that an offensive line matters to a stationary, pocket-passing quarterback. And the team's new equation could act as a scouting report for researchers looking to amplify the strengths or cover the weaknesses of their personnel, he said. For Zeng and his colleagues, that personnel consisted of more than 20 so-called transition metals that are generally worse than precious metals at catalyzing reactions. But the team showed that surrounding a cobalt, iron or other second-string atom with the right environment—sometimes a honeycomb of carbon atoms known as graphene, sometimes a network of nitrogen atoms—can elevate its performance. "Every offensive line is different," Zeng said. "How do you make the quarterback function the best in that pocket? How do you find the best quarterback within different pockets? "If you have a two-star quarterback, you need a better offensive line. But even a backup quarterback can perform well with the right line." Zeng authored the study with colleagues from Beijing University of Chemical Technology. The study appeared in the journal Nature Catalysis and was highlighted in Chemical and Engineering News, a magazine published by the American Chemical Society.